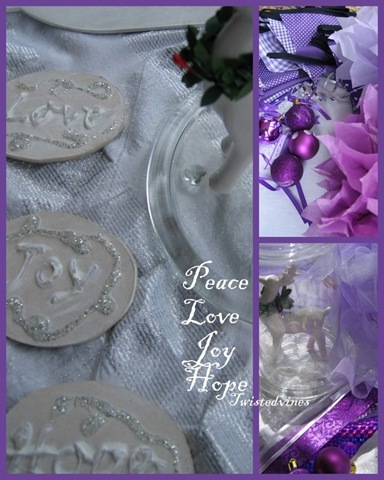 I made these little signs…using hot silicone glue and white paint, the words Peace, Love, Hope (purple candles) Joy (pink candle) and Christ (white candle) to hang on our five candles on our wreath. 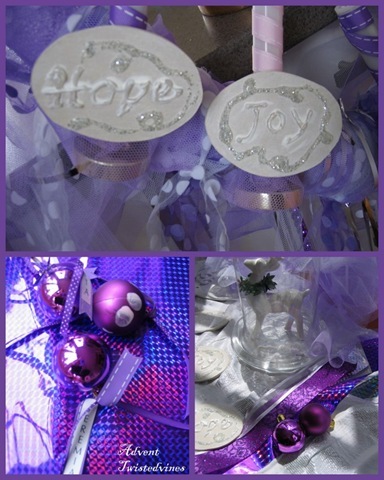 The little children had fun, placing paint on their fingers and leaving their finger prints on our Christmas baubles of bright purple, then we placed each childs name on ribbons to hang on our wreath. Advent is a special time, and as we prepare for Christmas let’s take the time to give thanks to God for all of the good things in our lives, especially the love of our family and friends. How lovely. It is wonderful to see Children’s little faces light up with the magic of Christmas isn’t it? Lovely decorations. I hope you enjoy the festive season as much as we are going to this year. It’s been an adventure for me, taking on the new role at Children’s Liturgy, it’s so rewarding in more ways than you know…the children are so wonderful and have lots of fun.. and so do the teachers! Have a wonderful festive season. Very special Yvette and so pretty too. How refreshing to read of someone who observes this season of contemplation and anticipation. I love Christmas, but is is so much more rewarding if we use this time to prepare. This year it seems so much more precious to me, after a ‘thunderstorm’ of a year..so many changes and new directions. This wonderful group of children teach me as well! Oh, the wreath’s colors and design are beautiful, Yvette. What a precious project. And when you mentioned that each child put their fingerprints on the baubles, I thought, what a precious gift to Christ. Since each child’s fingerprint is unique, it’s like they are bringing their individual uniqueness before Christ, yet as one mind and spirit. Perfect! 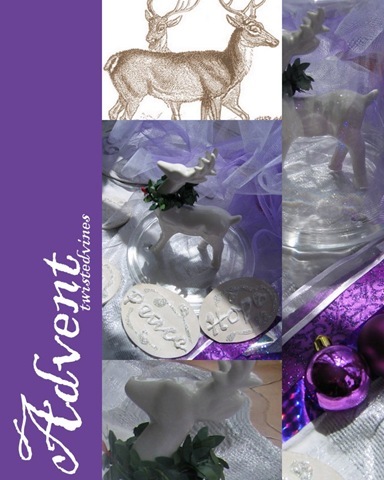 I hope this advent brings you the peace and joy you so deserve. It is a special time and this is a special post!! Joyful blessings to you too! Everything about this post, Yvette, is simply beautiful. Thank you. Love your colour scheme, my absolute favourite for Christmas.